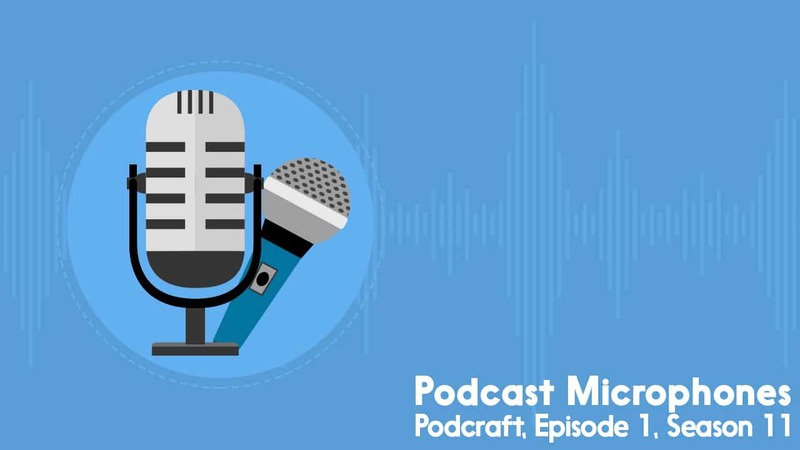 In this episode of Podcraft, we’re talking microphones. We cover the best microphones for podcasting, and how to choose the right one for you. For the full info, listen to the episode below. For series 11, we’re looking at your next steps in terms of equipment. In this series we’ll be going through all of the kit you can use for podcasting, from one end of the audio chain to the other – microphone to editor. For each type I’ll be covering Entry level and pro level, and talk about the lifecycle, ie. what you should start with and how/when you can upgrade. Equipment is where a lot of us totally geek out, spending far too much money on shiny new bits, and I’ve been more than guilty of this in the past. I’m hoping that this series can help you choose and sensible starting point, and guide you through the upgrade process over the coming years. I genuinely think that you should only upgrade your kit in line with your presenting and production skills. In the beginning you don’t need a £300 microphone, you need to practice talking to your audience. Then you need to practice your editing and audio production. Then you need to practice your storytelling and writing. THEN, you’re ready for really good quality kit. In a similar vein, don’t do it all at once. The most basic reason for that is that you’ll spoil the fun of buying new shiny bits by blowing it all at once! The more practical reason is that you really want to make sure you’re using every bit of kit you own in the best way possible. For example, start with the microphone. Learn how to speak into it properly, cutting sibilants and plosives, and maintaining a good distance. Then, learn it’s other quirks, such as background sensitivity and recording pattern. Once you know you’re using the mic in the best way possible, THEN you can buy yourself the next bit of kit. If you do it the other way around then you’ll end up confusing bad results with one piece of kit with bad use of another. You need to know the first element is working perfectly before you can hone your skills with the next. Are you a complete beginner with no real technical background, and no desire to learn about audio editing? If so there’s a tool called Alitu that’ll let you build your episodes in an incredibly simple way. It’s our ‘Podcast Maker’ web app. Alitu will take your raw audio, do all the volume leveling and cleaning up for you. It’ll let you add in your music, segments, transitions, etc. In fact, it’ll even go as far as to publish your episode for you once it’s ready! So if you’re in the “non-techy” and “complete beginner” camp, and the thought of editing and production is really holding you back, we’d love you to give it a 7 day free trial. The Podcast Host Academy is where you’ll find all our courses, resources, etc. We’ve everything in there from planning and launching, to interview and presentation skills, to equipment and editing, to promotion and monetisation. You also get access to our regular live Q&A sessions every 2 weeks, and there’s a community forum too. It’s the perfect place to plan, launch, and grow your podcast! PreviousWhy Would Anyone Listen to Your Business Podcast? NextWhat’s the Best Computer for Podcasting & Audio Production?